Simon graduated from the British School of Osteopathy, London, in 2001 with a BSc (Hons) in Osteopathy (winning a prize for final clinical competence). He gained multi-disciplinary experience at a busy practice in Bristol before moving to Guernsey. 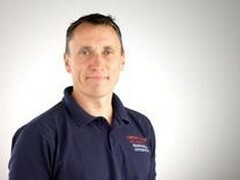 Simon is experienced in diagnosing and treating a wide range of musculoskeletal problems and treats a variety of neck, back, upper and lower limb problems from age 5 and upwards. He has a particular interest in sports medicine, having been interested in sport and fitness from an early age and has worked with everyone from young children to retirees and recreational weekend sportsmen and women through to professional athletes. He has recently completed a Post Graduate Certificate in Sports & Exercise Medicine. He is also interested in integrating Medical Acupuncture into the management of musculoskeletal related conditions such as headaches and low back pain. He is registered in the UK, with the General Osteopathic Council (GOsC) and is a member of the Osteopathic Sports Care Association (OSCA). Simon has treated many of the island’s top athletes having been part of the Guernsey Island Games Medical Team for the last eight years – Åland (2009), Isle of Wight (2011), Bermuda (2013) and Jersey (2015).